This exceptionally showy clumping grass will make an eye catching addition to any garden. 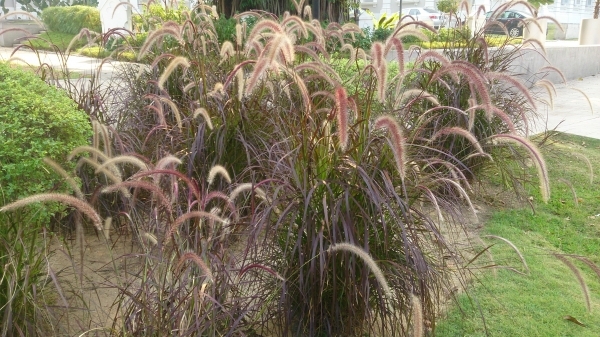 Pennisetum Purple Fountain Grass is a popular perennial grass renowned for its burgundy coloured foliage. The long, narrow, arching leaves grow quickly to form a weeping clump of striking burgundy/purple foliage. The feathery plumes are also a key feature - sitting above the main body of the foliage. The effect of the these moving in the wind is soft and beautiful. This is the ideal plant for gardeners that wish to add some colour, texture and movement to their landscape. This variety will tolerate a range of climatic conditions including high winds, humidity and heat, making it a versatile all round landscape performer. Purple Fountain performs well in high humidity and heat. It is dry tolerant once established.